A community-led design programme is being undertaken in Easton in Partnership with Bristol City Council and Sustrans. 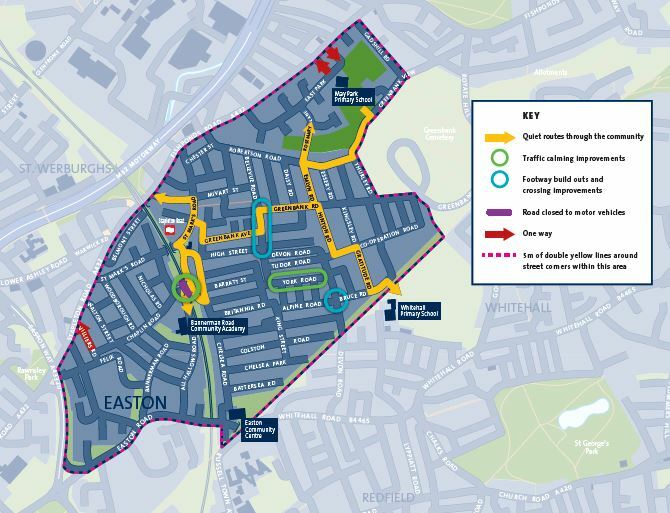 The Easton Safer Streets project has been developed by the community and Bristol City Council over the past couple of years in order to make streets safer and more attractive to walk and cycle in. One ways to reduce vehicular conflict at pinch points on the following roads; Freeland Buildings, Coombe Road and Villiers Road. Street closure to motor vehicles on All Hallows Road, alongside a speed table at the Albion Road Junction. This will help create a more enjoyable and attractive route for walking and cycling to school. The street closure re-allocates road space, providing an opportunity to for place making improvements. Footway widening and crossing improvements at Bellevue Road/Washington Avenue, Bellevue/Greenbank Road and Alpine Road/Devon Road. These junction improvements will make it easier for people to walk through the area by widening pavements and improving informal crossing facilities. Double yellow lines around street corners to improve visibility at junctions. The £500k scheme is partly funded by Bristol City Council and a government grant awarded to Bristol up until 2018. The Cycling Ambition Fund programme aims to upgrade walking and cycling routes across the city. Phase 2 of construction begins, Freeland Buildings, Coombe Road and Villiers Road one-way’s. From the 8th of April, we will be upgrading junctions and installing one way’s around May Park primary school. These works involve widening footways around the school as well as installing benches, bollards and a new tree. The scheme is programmed to take nine weeks to build. One-way traffic will be maintained throughout the build. Signage will be temporarily installed on site to show people the one-way arrangements. Once complete, the contractors will move onto the Villiers Road site. This is scheduled to take place in early June 2019. Easton Safer Streets engagement report 2017.